Martingale collars, also known as loop collars or semi-choke collars, are a special type of collar. They are frequently used by breeds like the greyhound whose elegant long necks can be thicker than their heads. 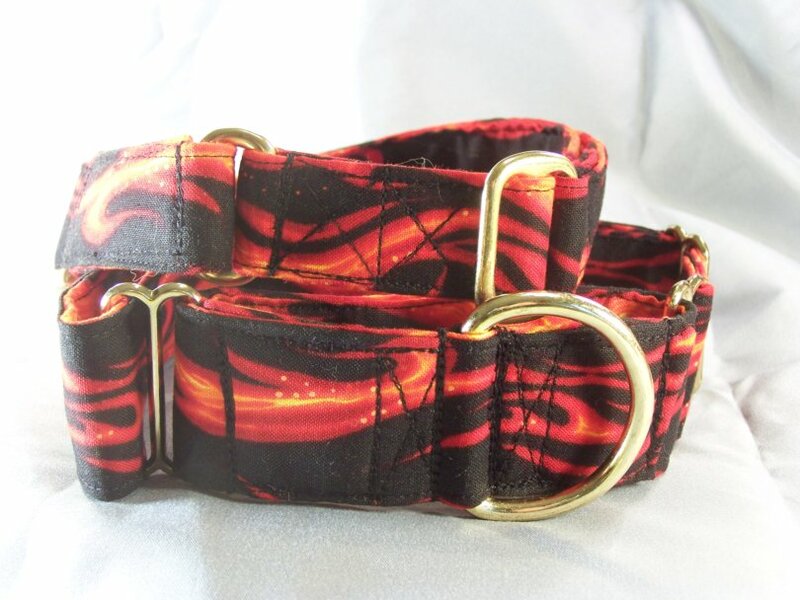 They are also used by people who are transitioning from a full choke collar. The martingale has a loop on the top portion of the collar where the leash attaches to the D ring. When a dog pulls on the leash the loop elongates and tightens. When pulling stops the pressure releases the loop. Martingale collars require more hardware, material, and time to make than standard collars, about one and a half to 2 times more on average, therefore they are priced higher than our standard collars. We also use all brass hardware in these collars. To choose a martingale collar just browse our standard collar selection and type in the pattern name (from the collar title) in the provided field.